Some of our Founding Fathers are famous: George Washington, Ben Franklin, Alexander Hamilton (especially after Lin-Manuel Miranda’s prize winning musical), John Hancock, etc. Other of our Founding Fathers (and most of our Founding Mothers) have been forgotten and ignored. Haym Salomon was an American patriot who does not get the attention and respect in the 21st century that he deserves. By unknown artist – USPS, Public Domain, https://commons.wikimedia.org/w/index.php?curid=2963517, stamp issued by the US Post Office in 1975. Haym Saloman was born in Leszno, Poland (called Lissa on German maps) in 1740. He traveled in western Europe as a young man, practicing and studying foreign languages and finance. In 1775 he emigrated to New York City, where he quickly became a fervent supporter of the cause of independence from England. He continued his profession in the New World by acting as a financial broker to colonial merchants involved in export and import. He joined the Sons of Liberty. He was twice arrested by the British as a spy. While a prisoner of the English, Haym Salomon was required to act as a translator for the Hessian troops. He also helped American and French POWs escape during this time, and urged the Hessian soldiers to desert. In 1777 Haym Salomon married Rachel Franks, the daughter of a respected Jewish family, at Shearith Israel Synagogue in New York. They had four children. After the second time he was arrested by the English, he was forced to flee for his life, leaving Rachel and Ezekiel behind. They were eventually reunited in Philadelphia. In Philadelphia Haym Salomon joined the Mikvah Israel Synagogue, which was founded in 1740, and included many patriots among its congregation. Salomon and other members of the congregation protested the religious test oath required by the Pennsylvania state constitution for all state office holders. Although originally intended to disenfranchise Quakers, who cannot take oaths, it also prevented Jews, atheists, agnostics, and those who followed traditional Native American beliefs from being elected to the Pennsylvania State Assembly. This eventually led to the United States Constitution not requiring a religious oath to hold office. Why Is Haym Saloman Ignored? Why doesn’t Haym Saloman have the fame and respect he deserves? There are three reasons for this. Soldiers are more exciting to read about than the men who pay soldiers and make sure they have uniforms and supplies. Haym Salomon was Jewish, and anti-Semitism is a real and ugly thing. Guilt. Haym Salomon died in debt, because his many loans were not repaid. His descendants tried for years to seek recompense. Haym Salomon died too young, only in his forties, on January 6, 1785, largely because of health problems he developed as a prisoner of the British. Claude Rains starred in the Oscar-winning Sons of Liberty, about Haym Salomon. It won Best Short Subject Film in 1940. It’s only twenty minutes, in black and white, but if you get a chance to see it, do so. 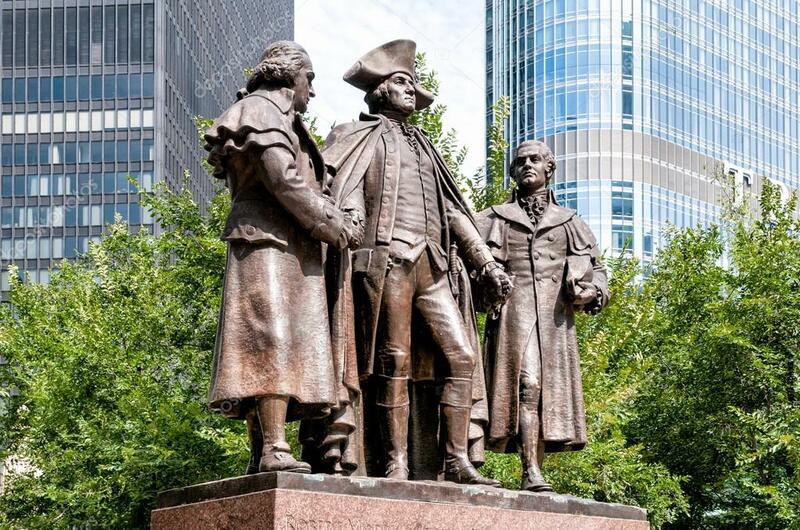 Statue of Robert Morris, George Washington, and Haym Salomon in Chicago’s Heald Square, designed by Lorado Taft, completed by Leonard Crunelle, Nellie Walker and Fred Torrey. Interesting. The name sounded familiar, but I think he might have been a single sentence in an AP US history book, where some of the others probably got whole chapters. Thanks for posting / sharing!